Make a plan that will support students' futures. Generosity comes in many forms, and it's often the best way for you to support important causes that matter the most to you in your life. When you give to The Pennsylvania State University, you help enhance the campus experience for students and strengthen our teaching, research and service. Start here by learning the different gift options available to you. We will work with you to find a charitable plan that lets you provide for your family and support Penn State. Answer a few simple questions about how you want to plan your gift. Discover how friends and alumni of Penn State are ensuring that the University continues to grow. Join this especially committed group of people who have included Penn State in their estate plans. 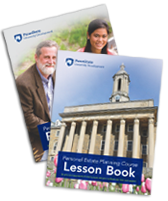 Secure your long-term life and estate plans with our free planning guides and brochures.